Ed Herbst recently forwarded me some information on floating or sinking tippets and frequently when Ed takes the trouble to do something like that it is worth reading. Ed is a newsman, perhaps more accurately now an ex-newsman, but he still has the drive to seek out a story, these days related more to fishing than to the vagaries of politics and the machinations of those in charge of public funds. The mail primarily consisted of a number of different viewpoints on floating leaders, floating tippets and fluorocarbon, the consensus apparently amongst the “new wave” was that you were better to float your leader and tippet rather than follow the age old rule that you should endeavour to get the tippet subsurface as far as possible. Much of the discussion focused on views from Peter Hayes, although there were extracts from other sources as well and various reasons for the apparent change of heart on this matter mooted. I thought it worthy of some further discussion. 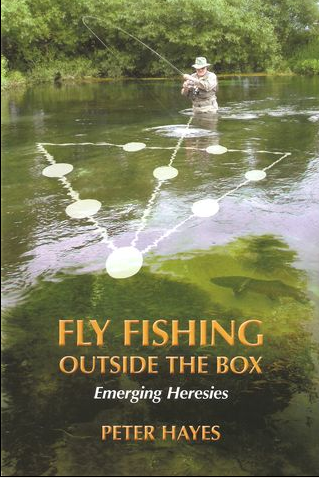 It would seem that in his book “Fly-Fishing outside the box” Peter Hayes boldly claims in Chapter six to know “How fish see the leader”.. Now I am always willing to listen to an argument, particularly a fly fishing argument and equally happy to defer to anyone who can provide some logical hypothesis no matter that it might go against my own beliefs. As we shall see Hayes makes some good points, some more than worthy of consideration, but off the bat I have to say that I try hard in my own writing not to say things like “how the fish see the leader” or “the fish think such and such”. No matter what we know, how well we research, it isn’t possible to know exactly what a fish sees or how it interprets the data. “How fish see the leader” therefore is in my opinion just a little too bold a statement. What we can confirm are certain scientific facts about refraction, light, opacity, which are scientifically proven. So anyway the idea put forward by Hayes is that all the guides and tutors are wrong, that they have foisted upon an unwitting angling public the idea that the tippet should be sunk as it is supposedly then less visible to the fish when in fact it is far less visible when floating in the film. There is some logic to the argument, according to Hayes’ own pictures it would seem that in the mirror the sunk tippet shows up twice, as indeed does the hook whilst the floating tippet is only visible as a single strand. Ok score one for the floating tippet if you like, but that is a pretty narrow consideration of the overall fishing situation. In my experience, refusals on flat water are virtually assured if the tippet is floating. Here a trout having purposefully approached the fly (one imagines having picked it up in the mirror) turns away at the last moment. Where I fish there is a second and to me far more critical problem, the shadow of the tippet on the bottom of the stream. In Hayes’s argument the peripheral effects of such are less important than the fly on which the trout should by now have focused its intentions. To be fair, Hayes is primarily I understand considering fishing in the UK where bright sunshine isn’t an overly problematic issue for most anglers, they simply don’t have enough of it. Plus almost every fly fisherman in the UK will tell you on a sunny day that “things are too bright”. Here on the Southernmost tip of the African continent clear blue skies and bright sunshine are the norm in summer. If fish didn’t feed during the brightest of days they would starve, if fishing guides didn’t fish on such days we would starve too for that matter. So we fish a lot in clear shallow water, to (at the risk of falling into that anthropomorphic trap once more) “educated fish”, on catch and release streams, in the brightest of conditions you might imagine. 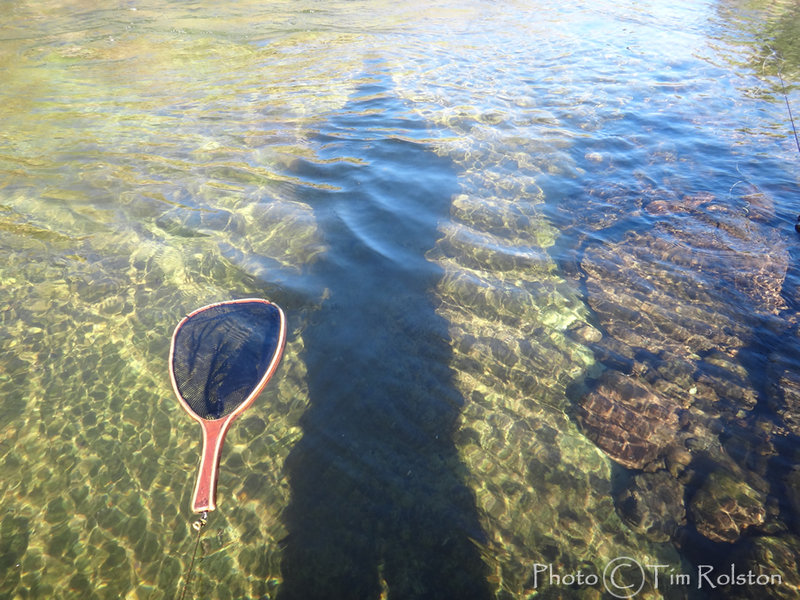 In clear water, with little weedgrowth, bright sunshine and clear skies, shadows are the enemy, including the shadows of floating tippet material. In such circumstances I assure you that a 7x tippet when floating will throw a shadow on the stream bed that looks like an anchor chain for a luxury liner. Additionally, any movement of that line, either resulting from casting or perhaps drag will create a semaphore on the bottom akin to a lightning bolt. So is the hypothesis of Hayes , that a floating tippet is better than a sunken one reasonable or not? If one were to offer advice, which way should you go? This isn’t about proving who is right or wrong, but about considering all the various factors at play. Firstly Hayes quite categorically states that no matter if the leader sinks or not, if you land it on the fish’s head or in its window it is likely to scare the hapless creature half to death. We are in agreement on that front. Hayes also promotes the idea of casting at an angle across to the fish rather than directly upstream at the fish, something that I hold to be absolutely correct. Fishing directly up to a fish unless the geography prevents any other option is generally in my opinion a very poor option. The piece also states that the sunken leader is more likely to drag than the floating one, based on additional surface contact with the water, you can’t really argue with that either, I am pretty sure that is true, although the degree to which the two differ I can’t imagine to be that gross, not over the duration of the average dry fly drift. Finally there is the suggestion that sunken tippets create unnecessary “slurping” noises on pick up that are likely to spook fish compared to the supposedly cleaner pick up of a floating leader, for my money that is more a function of poor casting than sunken lines. The “window” defined by Snell’s circle represents the area where the fish can see a clear image against the sky, outside of that the fish sees a reflection of the bottom in the mirror and disturbances to the surface film show up as a distortion of the mirror. Yes you may well be able to show that there are “Two tippets” in the mirror when sunk, and only one when floating but to my mind that isn’t a critical issue. There are also two hooks in the mirror and that doesn’t seem to bother the fish that much. In fact with a semi floating fly, emerger or Klinkhammer there are two abdomens as well. To my way of thinking the appearance of a potential food item in the mirror is simply the first trigger to the fish to investigate, fine analysis comes later in the drift when the fish is on the verge of committing. I don’t believe that the image in the mirror is that critical. 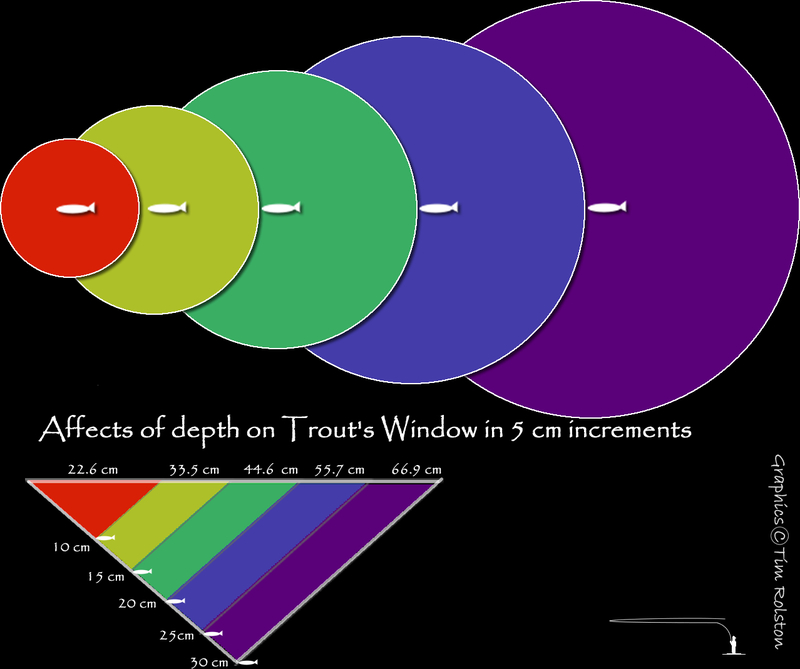 We have all seen trout approach items, flies, artificials, seeds etc which they have obviously noticed in the mirror , only to turn away once the item is in clear focus in the window. On a straight upstream cast one supposes that could possibly be an issue, however both myself and Hayes seem to be in agreement that such as cast is already your worst case scenario, irrespective of the floating or sinking properties of the tippet. Most anglers would opt for a cross stream cast and the very best anglers (Pascal Cognard for one) would opt for a curve cast on every presentation, keeping the visibility and the potential for interference from the tippet to an absolute minimum. That may be the case in cloudy and dull conditions but I seriously doubt the validity of the argument on bright days in clear water. It is pretty much a given amongst fly anglers that the clearer the water, the brighter the day and the less current there is to hide the tippet the more difficult it is to catch the fish. Or as one local wag at the World Fly Fishing Championships in France years back said to me whilst gazing over a flat calm filled with rising trout.. “ C’est Impossible” It is “impossible” because of the tippet and for my money I would give up a few of my prized rods for someone to come up with a fine tippet that consistently sank below the film. Not only is it less visible, but as or more importantly fish are generally far less wary of things under the surface. If you are a wild trout in a stream, nearly all the bad stuff in your life comes from “up there”. I would suggest that if you are a trout, two things that you are always going to be careful of are surface disturbances and unexpected shadows on the stream bed, both are likely to be bad news if you are a tasty trout in clear water. I equally have to add, that on stillwater, where there is plenty of time, I have frequently watched trout swim up to an artificial and turn away, over and over, until at some point the tippet finally sinks below the film, a trout approaches and eats the fly with apparent confidence. To my mind the floating tippet isn’t a good idea it would a take a lot to change my mind. It makes sense to me that this may indeed be true, but I am less than convinced that it really is a significant factor. Something that would easily be overcome with a few inches more tippet or a slightly longer leader, actually to my mind factors associated with getting slack into the leader, the construction, the length, the use of fine soft nylon are all more important that the possible additional drag from a sunk leader. 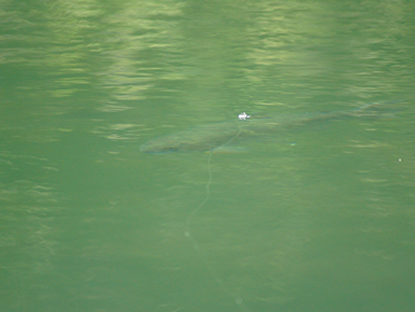 Bear in mind that as a rule I never fish leaders shorter than 14’ and frequently in the 20’ range even on small streams, specifically to reduce and/or delay the onset of drag. Done poorly that is undoubtedly true, but a slow draw, possibly combined with a roll cast pick up reduces any noise to virtually nil, whilst again on my home waters and the clear bright conditions under which we fish, dragging a floating leader across the surface may well be silent but the abstract art of shadows it creates on the stream bed is likely to spook every fish for miles around. For some time now I have been experimenting with striking angles when hooking fish. It seems that, particularly when dealing with small fish, a low strike angle provides a better hook up than one of a more upward trajectory. I suspect that this may well be due to two things: one that the smaller fish, if lifted don’t provide much by way of stability, tending to move with the strike and not allow sufficient pressure on the hook, (rather like a boxer riding out the punch), and secondly that the low angle keeps the leader and perhaps line in the water, offering additional purchase and a more direct strike pressure to the hook. Worth thinking about perhaps. I must admit that I always enjoy that people are thinking about things in the fashion that Hayes explores these concepts in his book, we are not really at loggerheads in terms of the discussion. There is a great deal with which I agree written there and of course circumstances vary from place to place. There may be a case in dull conditions where perhaps a floating leader isn’t such a disadvantage; I hesitate to suggest that in my mind it would be an advantage. But for my money on a clear, shallow, slow flowing pool on a Cape Stream, with the sun blazing out of a blue sky and a large trout in my sights, I would willingly slaughter a neonate and anoint the tippet with their blood if I thought it would assist in punching the nylon through the surface film. As always comments are most welcome, and I am always open to suggestion and discussion, one thing I have learned from years of fishing is that much of which we were once sure eventually makes way for a different perspective, frequently involving eating quite a bit of crow washed down with a jug of humility. If you can prove to me that floating tippets are an advantage I will willingly swallow my pride, but you will have to prove it on a sunny day in the Cape, when the water is low and clear the fish have all been caught before, and the average Northern Hemisphere angler is telling you that it is “too bright to fish”.